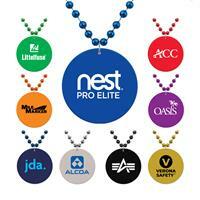 Beads are a fun & festive way to promote a business and get your logo noticed. Available in black (WP3BXBLKX), gold (WP3BXGOX), green (SP3BXGRX), navy blue (WP3BXNBX), orange (WP3BXORX), purple (WP3BXPUX), red (WP3BXRX), royal blue (WP3BXRBX), and silver (WP3BXSX). We apologize but due to state regulations this item cannot be shipped or resold to California. Award your valued customers with a fabulous promotional product! This stylish accessory comes with 7 mm colorful beads strung on a 33" strand necklace. Add your custom imprint on the 2 1/2" white medallion then hand them out at parties, toss them from parade floats or use as decorations in a home or office. Ideal for tradeshows, conventions and campus bookstores! Available in black (SPBLKX), burgundy (SPBBX), gold (SPGDX), green (SPGRX), navy blue (SPNBX), orange (SPORX), purple (SPUUX), royal blue (SPRBX), silver (SPSX), and red (SPRX). Today's your lucky day! This well-known cultural symbol features 7mm beads on a 33" strand necklace. 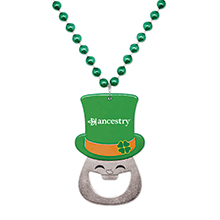 Add your custom imprint to the matching 2 3/4" shamrock-shaped medallion then toss them from parade floats, hand out at parties or use as decorations in a home or office. These identifiable medallions are sure to get your message out there. Ideal for sporting events, charitable fundraisers and campus bookstores! Also available as a blank product. 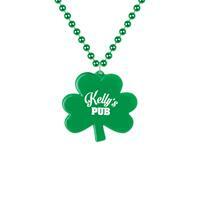 Our Leprechaun Bottle Opener Medallion Beads make a great Saint Patrick's Day or party accessory. The Leprechaun Bottle Opener hangs on a 33" necklace with 7 mm beads. The front features a green hat and face and your logo or company name imprinted. This is a fun and festive way to get your logo noticed and is a perfect giveaway for tradeshows and conventions. One color / location imprint only. These margarita glass medallion beads are great for your next fiesta or celebration! Features 7mm beads on a 33" strand necklace. 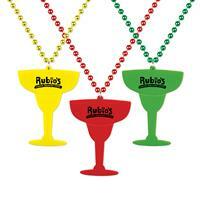 Add your custom imprint to the 4" X 2" margarita glass medallion and hand them out at festivals and events. Blank product also available. 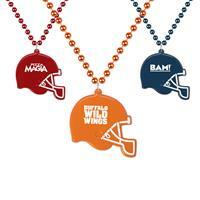 Score a touchdown during your next marketing campaign with these football helmet medallion beads! Features 7mm beads on a 33" strand necklace. Add your custom imprint to the 3" helmet medallions and hand them out during tradeshows, or use as decorations in a home or office. Ideal for athletic events, school fundraisers and competitions! Also available as a blank product. Stock design on one side only. Available in navy blue (S55081X), maroon (S55078X) and orange (S55080X). Score a touchdown on your next marketing campaign with this great promotional item! 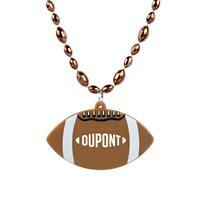 Features 7mm football beads on a 33" strand necklace. Add your custom imprint to the 2 1/2" football medallion and hand them out at your next big event! Ideal for parties, athletic events, school fundraisers and competitions! Also available as a blank product. We apologize but due to state regulations we are unable to ship bead products to California. Stock design on one side only. Have a fiesta! 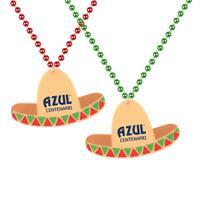 Our beads feature a sombrero shaped medallion on red and green assorted beads. Hand these out at parties, toss them from parade floats or use as decorations in a home or office. Great for Cinco De Mayo events and celebrations. We apologize but due to state regulations we are unable to ship bead products to California. Stock design on one side only. Celebrate Mardi Gras in style! 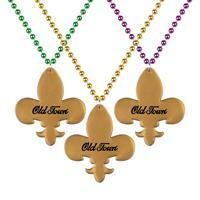 Our beads feature a Fleur-De-Lis shaped medallion on purple, green and gold assorted beads. Hand these out at parties, toss them from parade floats or use as decorations in a home or office. We apologize but due to state regulations we are unable to ship bead products to California. Hula anyone? Our 36" silk flower leis are perfect for a luau or summertime events and parties. Add your logo to the plastic, 2 1/2" medallion and really get noticed! A perfect promotional product to hand out during a festival, parade or charity event. An ideal promotional product for hotels, travel agencies and tradeshows. Assorted colors. Also available as a blank product. 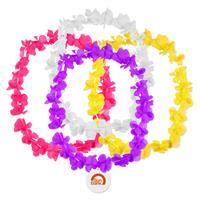 Our 36" plastic leis are perfect for a luau, pool party or end of summer event. Add your logo to the plastic, 2 1/2" medallion and really get noticed! A perfect promotional product to hand out during a festival, parade or charity event. An ideal promotional product for hotels, travel agencies and tradeshows. Assorted colors from which to choose. Must purchase in increments of 144. Our glow in the dark medallions features 7mm glow beads on a 33" strand glow-in-the-dark necklace (comes in assorted colors only). The medallions and the beads both glow! Add your custom imprint to the 2 1/2" medallion and shine a light on your next marketing campaign! Also available as a blank product. We apologize but due to state regulations we are unable to ship bead products to California.